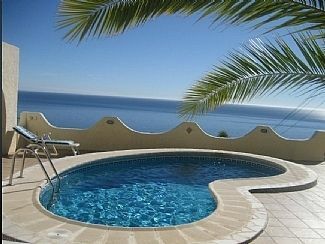 This delightful, secluded villa enjoys spectacular sea views yet is only a few minutes from the the long sandy beaches of Mojacar Playa. The villa is approached by a long private drive and stands behind wrought iron gates with sufficient parking for several cars. The spacious accommodation includes four double bedrooms. There are three double bedded rooms, two with en-suite bathrooms and patio doors on to the terrace. There is a twin bedded room and a family bathroom. All have air-conditioning. All bathrooms fully tiled with marble topped washstands. The spacious sitting room is bright and modern and has two sets of patio doors on to the terrace, and fabulous sea views. Outside the terraces provide seating areas in both sun and shade, with access to the gardens and swimming pool. The large roof terrace provides 180 degree sea views but with total privacy. There are plenty of sporting activities nearby including 5 golf courses, tennis, hiking and a variety of water sports. My husband and I are now retired and so have a little more time to spend in this beautiful part of the world. We have been visiting Mojacar since the mid eighties for family holidays with our two young children. It is so reassuring to us, that now they are adults , they want to recreate those wonderful family holidays we enjoyed so much, with their own children. Our first property was a two bedroomed apartment , but we found this house in 2000 and fell in love with it. The views are simply wonderful , and the villa is very private. Not far from the beach and yet quite secluded. The best of both worlds. It is a great family home , and delightful in every season. Mojacar is a very special place with something for all ages. Our children have adored holidaying here and now they have introduced their children to it , too. My son , who does triathlons, loves the cycling and sea swimming here and of course the running. He even runs to the gym from the house. For those less sporty, the beaches are wonderful, and the bars, beach bars and restaurants and excellent. En-suite bathroom to bedroom 1 with large walk-in shower, wc. En-suite bathroom to bedroom 2 with bath, shower, wc. Bathroom 3 with bath, shower, wc. All three are fully tiled with marble topped washstands and plenty of storage space. Washing machine in utility room. Washing powder provided. Lots of parking space in the driveway. Could accommodate several cars. The spacious lounge offers large flat screen satellite TV, video, DVD and hi fi. ipod docking station and wifi internet. Plus modern gas fire for winter evenings. Dining area seats 8. Various condiments for general use. All dishes and utensils, including plastic tableware and glasses for use round the pool. The kitchen offers dishwasher, fridge, oven, hob and microwave, blender and juice extractor, and full range of cooking utensils. Valle del Este top quality 18 hole course with practice facilities is a 20 minute drive. Desert Springs attractive and challenging 18 hole course. Cortijo Grande 9 hole (becoming18), beautiful views. Inland 25 minutes, Marina de la Torre 18 hole course with practice facilities, easier course, close to sea. 10 minutes, Macenas Beach, new course. Notes on accommodation: The layout of the house which is all on one level, and with the two en-suite bedrooms at either end, make it ideal for two families. 2 cots and a high chair are also available. The pool area is next to the house so care should be taken with young children. Outside: There are gardens to front, rear and sides of property. Plenty of seating. Tables and chairs and sunbeds. Private pool . Utility Room: The separate laundry room has washing machine and ironing facilities, plus a second fridge/freezer. Cleaning / Towels / Linen / Maid service: The cleaning service is weekly and includes all bedding and towels. Other: The terraces offer plenty of chairs, tables and sunbeds, in both sun and shade. BBQ. The property was lovely. Everything worked. All good. We had a lovely time and loved the villa and the beautiful views. The villa is situated 300 metres from the beach, but up a steep hill. 2 minutes drive or 10 minutes on foot. The sandy beach runs for 7kms and there is an attractive Paseo with running/cycling track planted with palm trees. Almeria Airport is 55 mins by car. Murcia 1 hour 20 mins. A car is essential. Supermarkets, banks and shopping are nearby. The picturesque old town of Mojacar, with its whitewashed houses, is 7kms inland. The pretty fishing village of Garrucha with marina is 5kms. There is an aqua park in Vera about 3kms. There are numerous excellent restaurants, bars and beach bars within easy reach, and perhaps one of the most popular and sophisticated nightspots in the province is on the beach, 2km away. Booking Notes: Bookings accepted by phone or email, and confirmed with a 20% deposit. Balance due 6 weeks before departure with a £150 bond. Changeover Day: Preferred changeover day- Saturday. Notes on prices: Prices are for the property per week in UK pounds.